Published: Sept. 19, 2018 at 01:33 p.m. 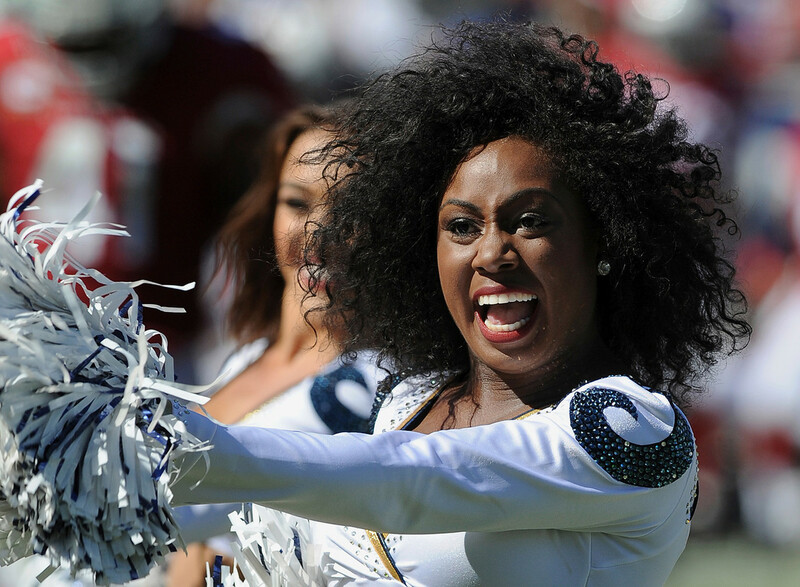 In Week 2 of the 2018 NFL season, cheerleaders around the league performed on the field and on the sidelines. Take a look at some snapshots of the best cheerleader performances. A Los Angeles Rams cheerleader performs on the field during a break in the action of an NFL football game against the Arizona Cardinals, Sunday September 16, 2018 in Los Angeles. New Orleans Saints cheerleaders perform before an NFL football game against the Cleveland Browns in New Orleans, Sunday, Sept. 16, 2018. New York Jets cheerleaders perform during the first half of an NFL football game against the Miami Dolphins on Sunday, Sept. 16, 2018, in East Rutherford, N.J.
Atlanta Falcons cheerleaders perform during an NFL football game between the Atlanta Falcons and Carolina Panthers, Sunday, Sept. 16, 2018, in Atlanta. Tennessee Titans cheerleaders perform in the first half of an NFL football game between the Titans and the Houston Texans on Sunday, Sept. 16, 2018, in Nashville, Tenn.
Los Angeles Rams cheerleaders perform during the first half of an NFL football game against the Arizona Cardinals Sunday, Sept. 16, 2018, in Los Angeles. A San Francisco 49ers cheerleader performs during the second half of an NFL football game against the Detroit Lions in Santa Clara, Calif., Sunday, Sept. 16, 2018. Dallas Cowboys cheerleaders perform before an NFL football game against the New York Giants in Arlington, Texas, Sunday, Sept. 16, 2018. The Denver Broncos cheerleaders perform prior to an NFL football game against the Oakland Raiders, Sunday, Sept. 16, 2018, in Denver. A Jacksonville Jaguars cheerleader performs during the first half of an NFL football game against the New England Patriots on Sunday, Sept. 16, 2018, in Jacksonville, Fla. The Jaguars won, 31-20. An Atlanta Falcons cheerleader performs during an NFL football game between the Atlanta Falcons and Carolina Panthers, Sunday, Sept. 16, 2018, in Atlanta.